We’ve discussed some pretty flattering attributes of the new MacBook Air lately, but here’s one that’s less than pleasant: a sizable amount of users are reporting the machine will completely freeze up seemingly out of nowhere, requiring a hard reset. Though not every new MacBook Air owner is experiencing the freezing issue, those who have seem to all being running the Chrome web browser when the system freeze occurs. This has anecdotally been confirmed by Gizmodo and their staff writers, and they also cite several Apple Discussion Board threads and MacRumors forum posts on the matter. With a reasonable amount of evidence pointing to a software bug in an existing version of Chrome, the solution for the time being is simple enough, try using the latest Chrome Canary build, Safari, or Firefox, each of which seem to resolve the issue for the time being. Google typically releases new stable versions of Chrome with some regularity so an update probably isn’t too far off and hopefully it will resolve the freezes and crashes once and for all. We have identified a leak of graphics resources in the Chrome browser related to the drawing of plugins on Mac OS X. Work is proceeding to find and fix the root cause of the leak. While the root cause of the leak is being fixed, we are temporarily disabling some of Chrome’s GPU acceleration features on the affected hardware via an auto-updated release that went out this afternoon (Thursday June 28). We anticipate further fixes in the coming days which will re-enable many or all of these features on this hardware. If you have a new MacBook Pro or MacBook Air and use Chrome, update it now to receive the temporary fix. Workaround for Freezing Macs with OS X 10.11.5 and OS X 10.11.4? Also affects 13″ 2012 MBP as well. Yup, coming to say this. It’s something to do with the Intel HD 4000 video chip, and maybe something that the built-in Flash plugin is doing causes the crash now that it is GPU accelerated. If you have the Intel 4000 and use Chrome 19.0.1084.56 you will experience it. Perhaps just a coincidence, but my 2006 Mac Pro has gotten two of these crashes in the past week – which is very unusual for the machine. I’m wondering if the cause is a bit wider than they realize, some recent update which I could have gotten also. How can a userspace app cause a kernel panic? @toto Utter nonsense. 10 years ago would be 2002, the beginning of OS X. I remember kernel panics galore, a factor of 10 higher than today. Easy solution to the new kernel panics — get rid of Chrome. Google has no incentive to cooperate with Apple these days. I was having difficulty with Firefox and Chrome causing system crashes. I disabled hardware acceleration in Firefox and have not had an issue all day. Just happened to me. 2012 MacBook with Chrome watching YouTube. My baseline MBA 11″ 2011 model has had this problem since Day 1. Chrome makes it worse but even with a clean-wipe and reinstall with no Chrome on it at all, it still does it 2 or 3 times a week. Hope Mountain Lion straightens this out! My 2010 mbp lion has been getting this. Sometimes the apps would crash if visiting sites or doing work on them. It’s an issue with Chrome & flash, disabling hw acceleration on flash should help. So where do I go to update it? Or is it saying to download Chrome Canary? It is not just Chrome. I had Kernel panics, uninstalled Chrome and started using Firefox…got kernel panics. 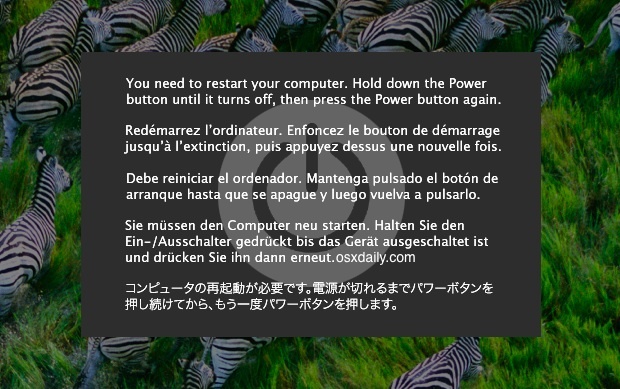 Moving to Safari and just got a Kernel Panic using Lightroom 4 (no browser open at the time). I am not sure if it is Chrome. It could be software – the question is if three different apps generate Kernel panics – is it the apps or is it the OS or is it some issue with hardware? One week ago, I updated my OS to OS X 10.9.2 on my Macbook Air. Since then, it freezes once a day and requires all my passwords. It NEVER happened before! This is aggavating on a less than a year old machine! I want my old OS, how can I go back?